Suzie Wright is a 3 ½ year-old miracle child whose rate of advancement has been phenomenal. She was a typically developing child until a year ago (5/19/15) when she suffered a traumatic brain injury from a commercial garage door falling on her. CPR was administered and she was rushed to the hospital. Suzie had a g-tube placed for nutritional needs and a tracheotomy for respiratory support. She also underwent a craniofacial repair in June of 2015. Suzie remained in a vegetative state with little response to outside stimulation for approximately two months. It was pretty much a miracle that she woke from that vegetative state–doctors were not confident that she would regain consciousness. But one day, Suzie opened her eyes and began interacting with family and medical staff. She waved “hi” on command and was attempting to speak (which she was initially unable to do because of the tracheotomy). As she continued to progress and show signs that she was medically stable, she was released from the hospital in July 2015. At that time, she began attending CSI Special Care (Arlington location) and was evaluated by the Great Strides therapeutic team, in the areas of Physical, Occupational, and Speech therapy. Upon starting therapy, she was unable to walk and had very little ways of communicating. She was also receiving all her nutrition via her g-tube and was not able to eat by mouth. Her attention span had decreased and she was impulsive with negative behaviors due to the frontal lobe injury. The Great Strides staff working with Suzie include: Katie Hartman, MOT, OTR/L; Ashley Ziccarelli, M.Ed, SLP-CCC and Adrienne Vickers, DPT. She is currently working on ascending/descending stairs, jumping, general strengthening, labeling colors, drawing shapes, completing puzzles, learning pronouns, identifying verbs from pictures, and other skills. Suzie is definitely a miracle child and prayers were answered for her family. Based on the progress she has made thus far in such a small amount of time, prognosis is good and her future looks bright. As always, there can be plateaus with progress but she has not had setbacks in the last year so we only see Suzie making gains and continuing to progress to maximize independence. Her therapeutic team is proud of Suzie’s advancement and look forward to providing her the skills towards continued success. A Little Bigger—A Lot Better! Great Strides will be acquiring some additional space located next door to the main office which means more space for more therapeutic learning and play areas for your child. Prymus is an adorable and friendly four year old boy who began coming to the Fletchers PPEC as a baby. He was diagnosed with spastic quadriplegia meaning that he has weakness and difficulty moving his arms and legs like he wants. In addition, the muscles of his face and mouth which would coordinate speech and oral feeding are also impacted. Prymus is a bright young boy who loves people and loves learning. He is devoted to his parents and has wonderful support from them. He has a high level of cognitive and receptive language skills but has difficulty expressing what he knows verbally or through gestures, signs or pointing. Prymus’ GS Therapy team include: John Kirkland, DPT; Jess Dailey, DPT; Julissa Taveras, OTR/L; Robyn Hershberger, MS-CCC-SLP; and Susannah Doherty, MS-CCC-SLP. Prymus is learning daily living activities such as how to take off his socks, grasp a cup to drink independently, or grasp and release objects. He is also learning how to use one part of his body (one arm or hand) while keeping the rest of his body still. Educational activities and pre-writing skills are also addressed to prepare him for school. Prymus has difficulty completing the very rapid, alternating fine motor movements of the tongue for speech production. He must work hard to produce even voicing to command. His voice is often much easier for him to produce spontaneously, such as shouting or laughing, but he still needed a method to help him communicate while he works on improving coordination and strength in his oral muscles for speech. Speech therapy also continues to focus on increasing Prymus’s vocabulary and understanding of language, as well as improving his ability to chew and swallow solids, master cup drinking and swallow safely to avoid aspiration. Additionally, although he can move his arms, he has difficulty with performing tasks such as pointing with a finger, or targeting a small picture target with his hands to select it as a means of communicating. Therefore, usage of pictures or IPAD apps were not able to match the cognitive ability of his language skills. After consulting with an assistive technology specialist, his speech therapists decided to try an eye gaze communication system that operates by Prymus “choosing” words with his eyes which then “speak” loud for him. He has just received this device for a trial period during which he will learn how to use it and his family will decide if it is right for him. 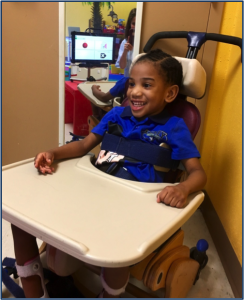 In addition to the eye gaze communication system, to give Prymus the very best devices to aid him in his growth in the physical therapy area, Great Strides has helped him obtain a specialized walker called the Theraputic Ambulatory Orthotic System or TAOS Walker along with other medical equipment such as braces for his feet/ legs, a wheelchair and a bath chair. This is the first time Great Strides has ordered such specialized equipment like the TAOS for a child. We are excited to be able to provide the TAOS as there are children who have different needs and every walker or device is not always appropriate for every child, parent and physical therapist. The TAOS has two basic parts, a bracing system and the 4-wheeled base. The bracing system provides side to side and front to back support to the child’s trunk and pelvis. Along with the TAOS, physical therapists are working diligently on helping Prymus improve a method for locomotion independently in other ways. They also help him with increasing control of his head and neck muscles, and torso so that he can better sit upright without support. Great Strides is proud to be a part of Prymus’ learning, growth and continuing advancement. Recognizing each family and patient are unique, it is Great Strides’ mission to enhance quality of life through exceptional therapy services in varying areas and locations geared specifically to your child’s needs. Our dedicated interdisciplinary team of more than 65 compassionate and tenured therapists work together to provide comprehensive and coordinated care for children with special needs at Great Strides’ premier pediatric rehabilitation center and the McKay scholarship-approved private school. In addition to our main clinic and school, located at the Jacksonville Pediatric Enrichment Center in Mandarin, Great Strides provides quality services in numerous locations around Northeast Florida, including public and private schools and at medically fragile day care centers—known as Physician Prescribed Extended Care or PPECs. PPECs are medical day care centers dedicated to the excellent care of medically fragile infants and children. PPECs are specifically designed to optimize the development of each child’s independence, while helping them reach their full potential. Daily care is provided by trained nurses centers involves clinical interventions, therapy services and educational activities as well as transportation if needed. more opportunity for learning growth learning growth and skill advancement for your child. An example of a recently purchased advancement to aid in the progress of a child with disabilities is also a wonderful success story. Each May, Better Hearing & Speech Month (BHSM) provides an opportunity to raise awareness about communication disorders and role of ASHA members in providing life-altering treatment. This year is special because it’s the 75th Better Hearing and Speech Month (BHSM) in the United States. For 2016, the BHSM theme is “Communication Takes Care“ and reflects the important service of health professionals in speech therapy positions. In honor of the how their important skills benefit patients all year round, the following is a review of current statistics on communication disorders and some of the challenges the modern speech therapist face. According to the National Institute on Deafness and other Communication Disorders, the number of Americans suffering from speech, voice, language or hearing impairment hovers around 43 million—in that sobering statistic, there are at least 28 million confirmed cases of hearing loss—and the figure that resonates? 10% of these communication disorders are owned by our children; reason enough for SLPs to get up each day and excel at doing what they do—teaching strategies that help patients cope and overcome. Because a child with a communication disorder is 4 or 5 times more likely than his peers to suffer from significant reading problems, speech and language pathologists are relied upon by the general public to anticipate those hurdles, and, if possible, lift them out of the way; of course, SLPs are there for anyone in need, at any age, unwilling to let communication disorders hamper social lives, careers or G.P.A. That being said, have you taken stock of your own health lately? How’s your hearing? It may surprise you to know that of those 28 million people we mentioned earlier—the ones with hearing deficits—only a quarter of them seek diagnosis and hearing aids; since this is a “silent treatment” we can’t afford to perpetuate, here’s a shortlist of symptoms we’d like you to consider. If you don’t get around to thinking about these issues this month, but nonetheless like a historical excuse to take charge of your hearing and communicative health, let June inspire you too. On June 27, 2010, Helen Keller celebrates her 130th birthday. While not a board certified, and rigorously trained speech therapist, her teacher and mentor, Anne Sullivan, who employed SLP skills helping Helen, made a huge difference in the quality of Helen’s life; to come so far a century ago, is so telling of what speech therapists are capable of now. This May we ask you to celebrate Better Hearing and Speech Month and to keep working your miracles all year long.